Model 2400/2500/2600/2700 Hopper Feeders — Designed specifically to automatically feed random loaded sliding, rolling headed or hanging parts with diameter ranges within a 2:1 ratio. Parts are elevated and gravity fed into chutes with various orienting devices designed to provide a continuous flow of product. 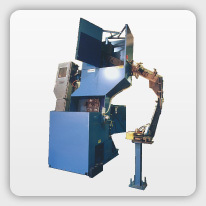 These feeders may be used to feed all types of grinders, presses, machining equipment, and specialty machines, including forging equipment. Conveys universal joint bearing cups from 15” to 60” above the floor. Feeds from a random loaded, floor mounted hopper. Hex head fasteners are elevated from the hopper via a cleated belt and discharged randomly into customer’s load chute. Feeds from a random loaded floor mounted hopper. Parts are elevated from hopper via a cleated belt and discharged randomly into a customer supplied vibratory bowl. Feeds from a random loaded, floor mounted hopper. The parts are elevated from the hopper via a cleated belt and discharged in a rear chute.